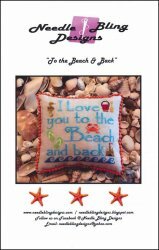 To The Beach & Back [D6400] - $9.00 : Yarn Tree, Your wholesale source for cross stitch supplies. Cross stitch pattern by Needle Bling Designs. The verse "I love you to the beach and back" is accented with flip-flops, a crab, a seahorse, a sandcastle, a pail, and other beach motifs. Stitch count 88h x 90w.